The popularity of vaping synthetic drugs – inhaling them in a vapor form, rather than smoking – is increasing in the US and UK. Vaping is accomplished using an e-cigarette or “vape pen”, an electronic device that atomizes liquids and makes the vapor available for inhaling. Users load a liquid solution containing their drug of choice into the device, turn it on, and inhale. First introduced as a way to help tobacco smokers eliminate cancer-causing chemicals from their habit, e-cigarettes have become a $2 billion industry. Today, vaping is quickly becoming the most popular adult way to ingest nicotine. Vaping is so popular, in fact, that the Oxford Dictionary named “vape” the word of the year for 2014. But there is a dark side to vaping: it is becoming a popular way to consume a wide range of dangerous new synthetic drugs including Bath Salts, hash oil, psychedelics and synthetic marijuana – often called Spice or K2. In particular, vaping of synthetic marijuana appears to be on the rise, based upon recent studies and news reports. Spice / K2 Use Is Declining In the US – Or Is It? According to the latest annual NIDA “Monitoring the Future Results” report on high school drug use (just released), e-cigarette use in high schools and universities has skyrocketed. Today, many more young people use e-cigarettes than smoke cigarettes. There was some good news in the NIDA report. Self-reported use of synthetic marijuana has declined sharply, from 11% of high school students using the drug annually in 2012 to about half that in 2014. If spice & K2 use is down, then it’s time for a high-five, right? We think a high-five may be premature, because many teens, especially the youngest, may not even aware they are ingesting Spice when they vape it. If we’re right about this, then Spice / K2 use may be under-reported in the NIDA report. The confusion stems from several sources. The first point of confusion is the constantly-changing names used for drugs containing synthetic cannabinoids. Today, sellers of synthetic weed are aggressively marketing liquid forms of the same chemicals used in traditional synthetic pot under new names. 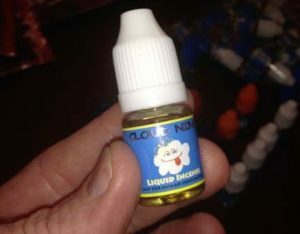 Liquid synthetic cannabinoids are sold using brands like Cloud 9, Hookah Relax, Crown, Bizarro, Shisha and Mad Hatter. By selling under new names, spice merchants bypass the increasing awareness of the dangers of smoking synthetic pot. For example its bad side effects, harsh withdrawals and addictive nature. The second reason for confusion is the simple fact that most e-liquid drugs don’t tell you what their active ingredient is. In a recent popular Reddit thread about the practice of vaping synthetic drugs, it took several experienced drug users a while to finally agree that the active ingredients of the drugs discussed in the thread are indeed synthetic cannabinoids, more specifically the chemicals AB-PINACA and AB-FUBINACA. Separately, a Michigan local government analysis of Cloud 9 came the the same conclusion. Soon after that, a 19-year old man in Michigan OD’d on spice while inhaling Darth Vapor, a popular brand of flavored e-liquid. We think the NIDA report doesn’t tell the complete story about use of synthetic cannabinoids, especially in US high schools. We know that vaping of synthetic marijuana is on the rise, so it’s not a hard stretch to guess that vaping of spice & K2 could be replacing smoking incense, and teens are not aware that the underlying drugs are the same. In fact, the sale of liquid synthetic marijuana has increased dramatically since 2012. Spice / K2 merchants are clearly pushing it hard online. And, more people are searching for liquid spice online. Take a look at the following Google Trends chart, which shows the search engine popularity of “liquid K2” and “smoke K2” over the past few years: note the opposite trends. Finally, consider our experience running the largest dedicated spice addiction website. The number of people calling our Addiction hotline is up considerably this year, which doesn’t support the NIDA claim that Spice use is down. In addition, many of our newer Submitted Stories mention the use of liquid spice and K2. That wasn’t as true, last year. Is Vaping More Dangerous Than Smoking? In states where vaping of liquid synthetic drugs has been rising in popularity, a number of dangerous incidents involving liquid synthetic cannabinoids have been reported. For example, due to a rash of hospitalizations in Texas, several counties specifically outlawed Cloud 9, a popular liquid form of synthetic cannabinoid. In Michigan, dozens of teens have been admitted to hospitals after overdosing on Hookah Relax and Cloud 9. Perhaps the most alarming new trend made possible by liquid forms of the drug is the mixing of different drugs to achieve a unique high; for example, boosting hash oil with a dose of liquid synthetic pot and/or a psychedelic such as 2C-P.
With rising e-cigarette use and greater availability of liquid synthetic drugs, now anyone can mix-up their own unique hookah blend for their next party. This is a dangerous new risk for first-time users, especially. To put it simply: it’s a lot easier to get a 13 year old to inhale your drug cocktail than to smoke it, especially when it smells so good. It doesn’t burn your throat; it tastes good. It doesn’t leave a smoky or chemical smell in your clothes; it smells nice. It can deliver a much stronger, more potent high. Most importantly, no one can tell you’re doing drugs. Bottom-line, ‘vaping’ may be the most dangerous new trend to hit synthetic marijuana since the drug hit our shores. This entry was posted in Spice Information and tagged cloud9, e-cigarette, ecig, kids using spice, madhatter, teen, vaping.